Core Business for the High Court? The Native Title Act 1993 (Cth) is discriminatory in its treatment of Indigenous peoples’ land interests compared with those of freeholders, particularly in relation to the provision of public infrastructure on their land. Section 7 of the Native Title Act does not permit the Racial Discrimination Act 1975 (Cth) to be used to effect a cure of that defect. Constitutional recognition for Indigenous Australians must address this incongruity. Indigenous Australians want it to be addressed in the referendum questions. Some commentators have warned against addressing it. Father Frank Brennan, for example, believes addressing such discrimination will lead to the failure of the referendum. This article asks if there can be an accommodation of the two views, both of which are compelling in their own way. It also suggests ways in which the Constitution and legislation might be amended to address such discrimination if ultimately the politics of the referendum questions does not allow discrimination to be dealt with in the Constitution in the way many Indigenous people would prefer. The common law doctrine of forbearance emerged in the 19th century and remains part of Australian law, having been recognised by the High Court of Australia on a number of occasions, including most recently in Agricultural & Rural Finance Pty Ltd v Gardiner (2008) 238 CLR 570. The doctrine draws a distinction between an alteration to the mode of performance of a contract and an alteration of the contract itself. This article examines the genesis and ambit of the doctrine. It then considers the doctrine critically and asks whether it has continuing utility. This article looks closely at how two systems of law namely the Convention on the International Sale of Goods (CISG) and the common law resolve an important principle of law, in this case the issues of mitigating losses and the awarding of damages once a contract has been breached. The analysis relies on Art 77 of the CISG which deals with mitigation, and the recent High Court decision in Thai Airways International Public Co Ltd v KI Holdings Co Ltd  EWHC 1250 (Comm). The article also briefly traces the problematic application of the CISG in Australia. The purpose of this article is to indicate how mitigation ought to be applied in Australia under the CISG by highlighting the differences between the CISG and the common law. 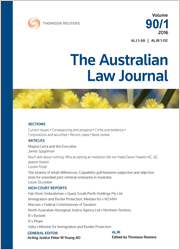 For the PDF version of the table of contents, click here: ALJ Vol 92 No 3 Contents.